A complete set of accounting, management and clinical reports to have a full control of every area of your dental office. 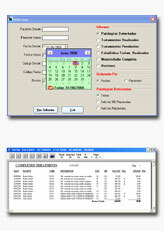 Customizable reports (Dates From and To, Patients From and To, Treatments From and To, Doctor, etc.) and adaptable to the doctor's needs. Assigned appointments, indicating if the patient attended or not.